For most of North Carolina’s hatchery-supported trout waters, trout season begins the first Saturday on April. But in Cherokee, where trout fishing is now permitted year’round, the traditional “opening day” will be celebrated a week earlier, with a special tournament on Saturday, March 31. The Second Annual Cherokee Opening Day Trout Fishing Tournament will give participants a chance to catch $10,000 worth of tagged trout in the rivers of the Cherokee reservation (excluding the 2.2 miles of catch and release waters). Hundreds of specially tagged fish will be stocked in the Cherokee public fishing waters, and when a tagged fish is caught it can be redeemed for cash prizes ranging from $20 to $500 based on the color of the tag. The tournament is open to all ages and for all legal fishing methods. The entry fee is just $5 – available everywhere Cherokee fishing permits are sold. Of course, registration is necessary to redeem prizes. 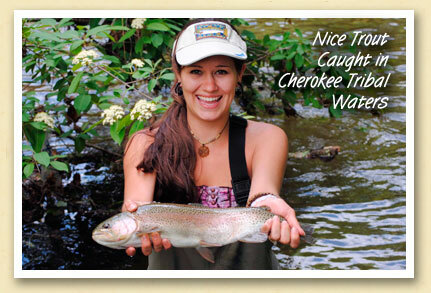 You’ll find more information about fishing on the Cherokee reservation at FishCherokee.com. And for information about fishing throughout the Smokies, go to the fishing page on GreatSmokies.com.